Last night our midwestern sunset was unique. Purple and pink and fuchsia filled the sky. Those bold colors made a perfect backdrop behind the dark brown tree trunks and leafless branches. 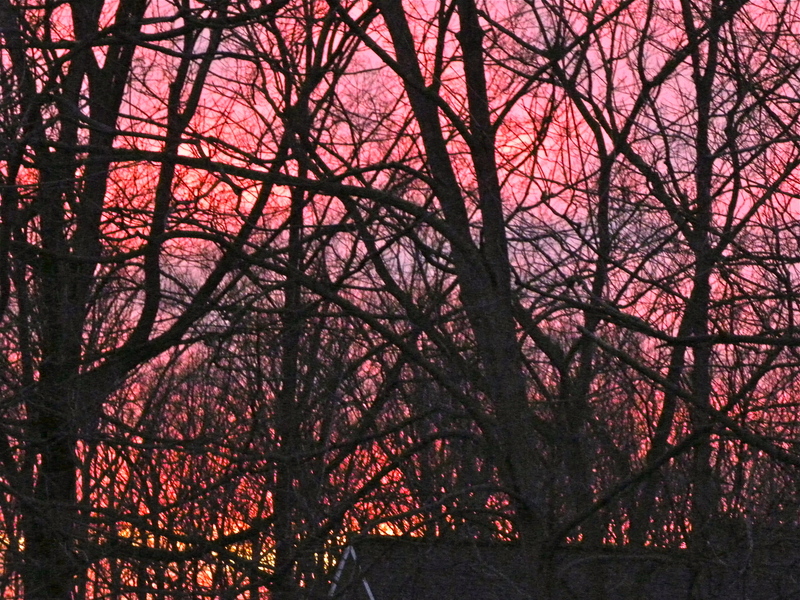 Looking out my kitchen window the jumble of trees and color seemed like one unified whole. The view was more like a watercolor painting than a glimpse into my mundane backyard. February has been comfortable this year. The temperatures have been in the 50’s instead of the 20’s. The sun has shone more days than not. 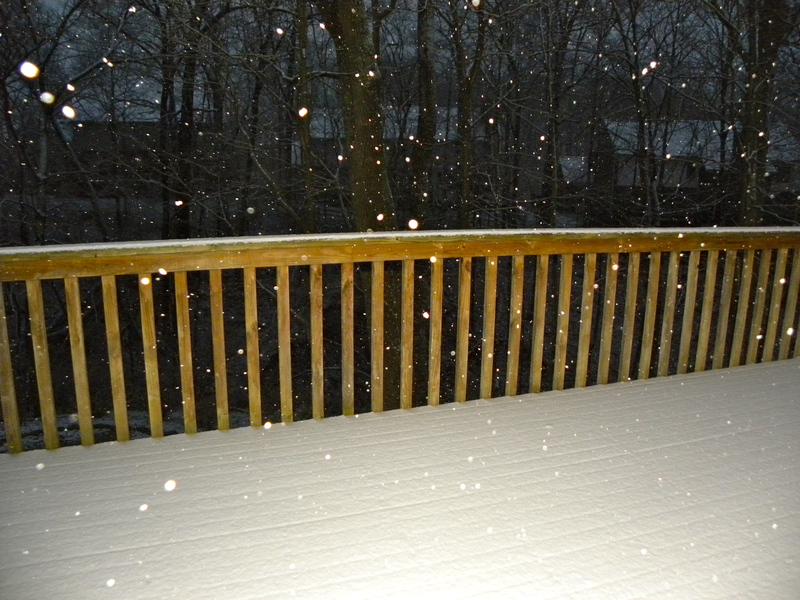 Snowfall has been negligible. As a result of this unusual weather, I find myself much more light-hearted than I usually am at this time of year. More hopeful. More focused on dreams and plans and doing. It’s a gift, this winter of mellowness. A gift that is difficult to ignore. ~ We awakened to snow this morning. Just a dusting. Falling softly, no malicious intent. Unlike last year when we had 30″ of snow by February, today’s snowfall brings our yearly total to just under three inches. 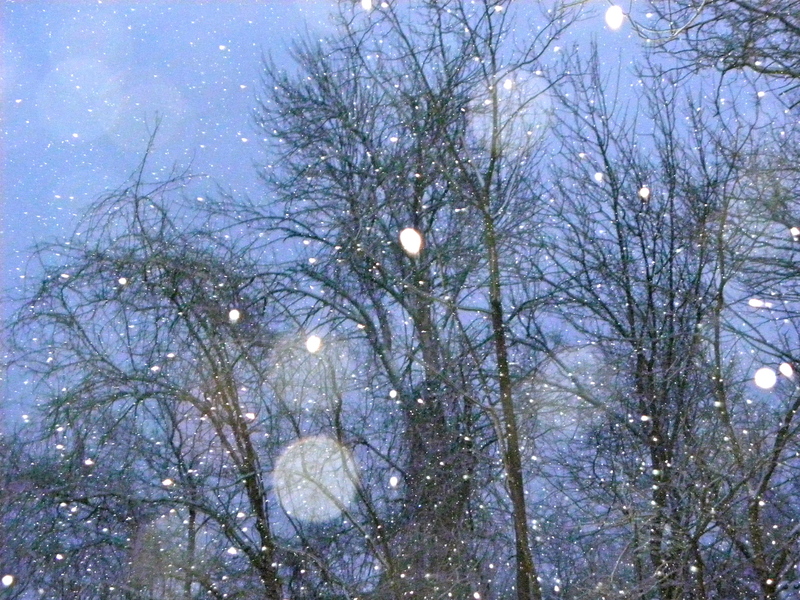 I can live happily– angst-free during a winter like the one we’re having this year. Hallelujah! ~ I read Leo Babauta’s book, The Power of LESS, while on vacation. It’s a fast read that I recommend to anyone who is trying to figure out how to live a simpler, more meaningful life. After reading the book I made a few notes and began contemplating my life. Consequently, this week I’ve decided what I value, what I love, what my goals are. I can live happily– focused on what means the most to me. Yes! 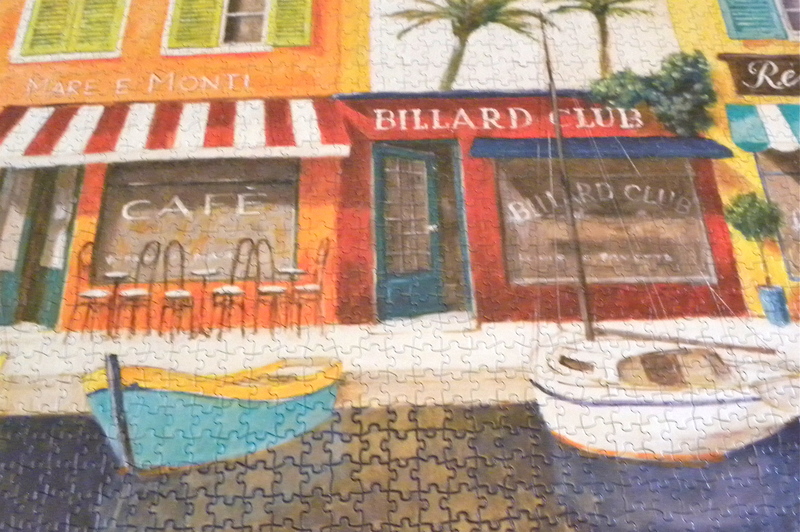 ~ We finished the puzzle. Even though it had 1000 pieces it went together quickly. 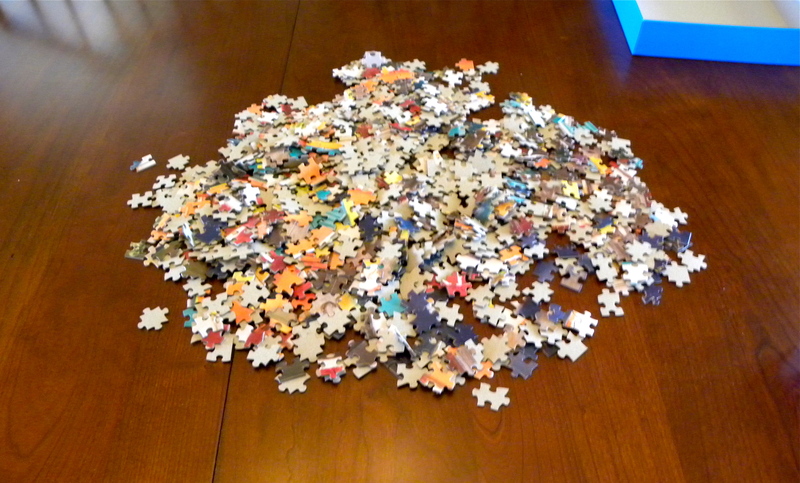 With that many pieces I thought that we’d be fussing with it until March. But it turned out to be easy-peasy mac & cheesy. I can live happily– satisfied with something going better than planned. Yeah! ~ I sent away for some business cards for this blog! I’ve always wanted to share my blog with people in real life– not depending on them to scribble down this blog’s name & address on a scrap of paper. This will allow me to easily and smoothly introduce people to The Spectacled Bean. I can live happily– contented with the knowledge that I’m doing my best to promote this sweet little bloggy. Ever onward! 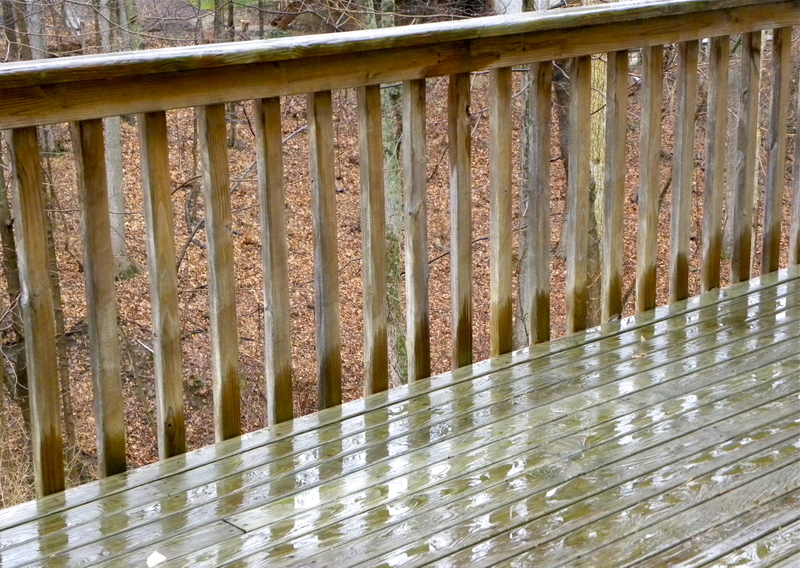 Posted on January 11, 2012 February 6, 2012 Categories Thinking AboutTags Introspection, Photo Story, Weather4 Comments on Wet. ~ We decorated the outside of our house this year. We don’t always do that, but this year we decided to put some lights on the bushes out front, a few wreaths on a few windows, and one long strand of lights wrapped around the deck railing out back. So far the decorations are surviving our record-breaking rainy weather without any prob. They’re all on pre-set timers, so they know what to do and when to do it. Wetness be damned. ~ After we decorated the outside of the house, we decided to put up a Christmas tree in our TV room. We don’t always do this every year either. Naturally the old lights that we had weren’t working, so Z-D drove over to Lowe’s and then Home Depot to buy a total of four boxes of the same GE multicolored lights to put on the tree. All of our ornaments from past years were in good shape, so we used them without buying anything new. The tree is pretty and colorful– the perfect antithesis to the bleak weather outside. ~ Most people who know me know that I’m not a fan of the holiday season. I tolerate it with gritted teeth and a quiet grace. I dislike the phoniness of it all. Too many people telling me too many ways in which they’re overwhelmed– by decisions that they freely made. Commitments they accepted for reasons they can’t explain, but will whine endlessly about fulfilling. To me, it seems like a time of faux friendship and forced frivolity. Not centering and joyful at all. ~ Zen-Den may be taking some vacation days at the end of the month. This will depend upon whether problems develop at work. We’ve made no formal plans to go anywhere, so if he does take the days off I think that we’ll be taking a staycation. Lunches out at some upscale restaurants that we like; a visit to the zoo to see the lights; a few rounds at our fav English pub. Nothing elaborate, just doing some fun things– because we want to. 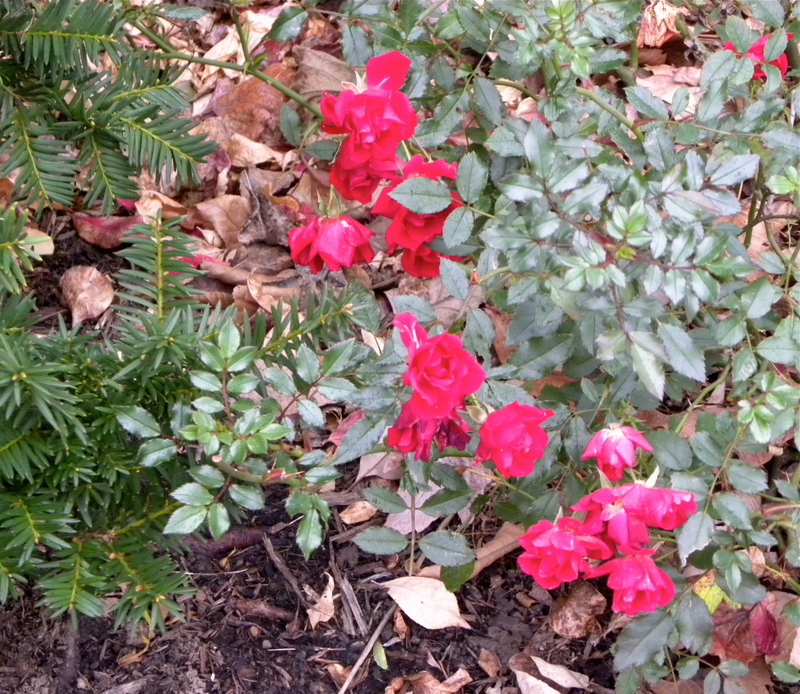 Over the course of this last week the colors have changed around here. There are a few last shots of color here and there. God bless red roses. I try to memorize the color so that during the bleak months I can remember it– and keep my spirit alive. Do you do this too? 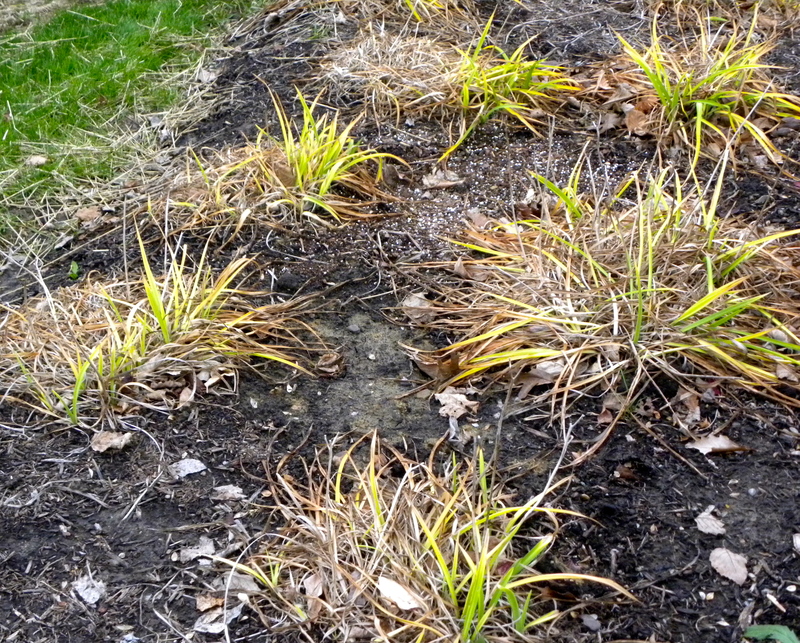 This is what is left of our Happy Returns Daylilies. I love these plants. In the summer their lemony yellow flowers make me smile. And now they remind me to have faith in the process. Bright colors will return again. Yes? 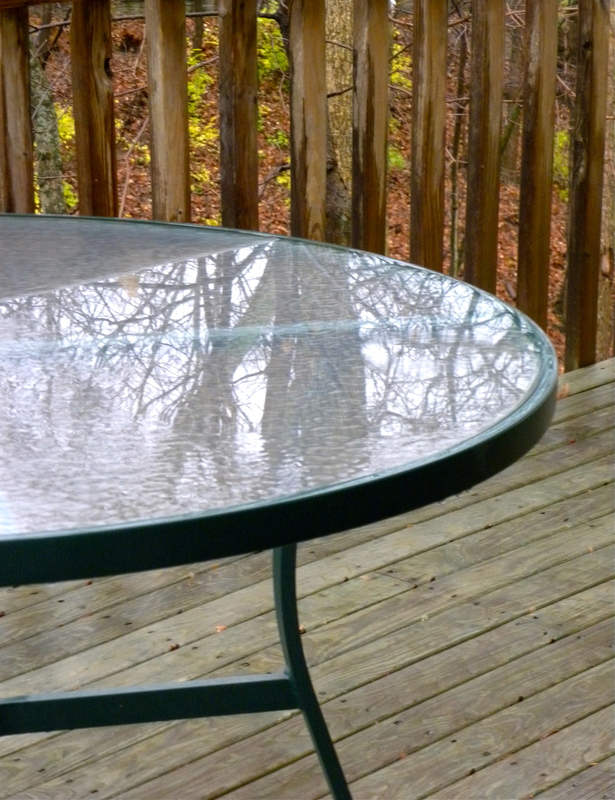 The water on the glass-top green-rimmed table is doing a great job of revealing the bleakness of the woods beyond. I love reflections. What is real and what is imagined? And then there is the woods back of the house. The leaves on the trees are all down now. 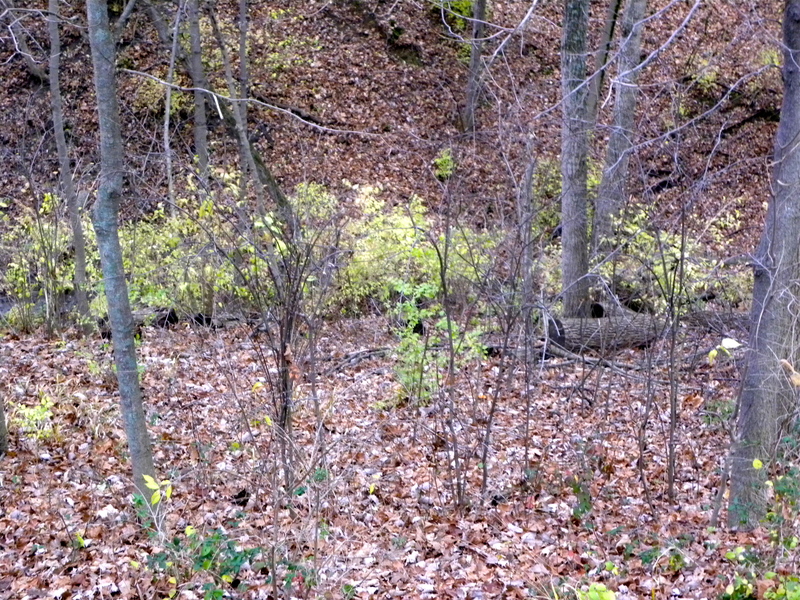 I like how easy it is to see the grayish brown trunks of the trees. Very visual and organic. There are no straight lines in nature, eh? Our Fourth of July weekend was rainy, damp, humid. No picnic in the park. No day at the zoo. No baseball game with fireworks afterward. Instead, we had a weekend that only a mold spore could love. So having nothing festive and fun to do, Zen-Den and I decided to be very grown-up and act like serious homeowners. First, we super scrubbed the kitchen— oven, cabinet doors, pantry, freezer, granite counter tops. Granted the kitchen wasn’t particularly dirty to begin with, but I have to admit that it’s amazing how shiny it looks now. Clean and inviting. Quite the happy space. Then Z-D painted the sitting room— aka the un-bedroom. After much debate about what color to put on the walls, we chose a very pale shade of gray that reads slightly blue. 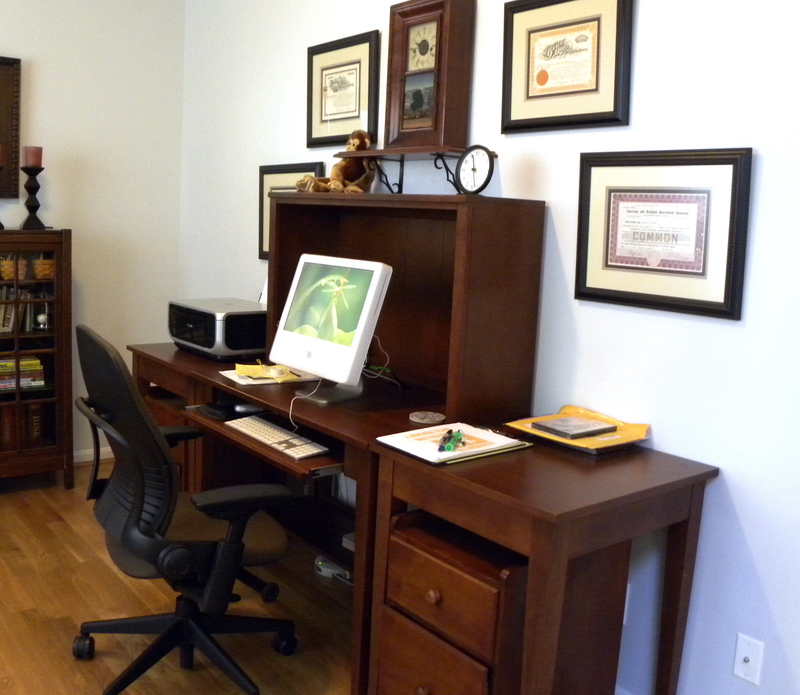 Combined with the room’s white trim, this shade of gray creates a relaxing and easy space. Rather like being inside a cloud. Airy. Filled with possibility. And that, kids, was our weekend. 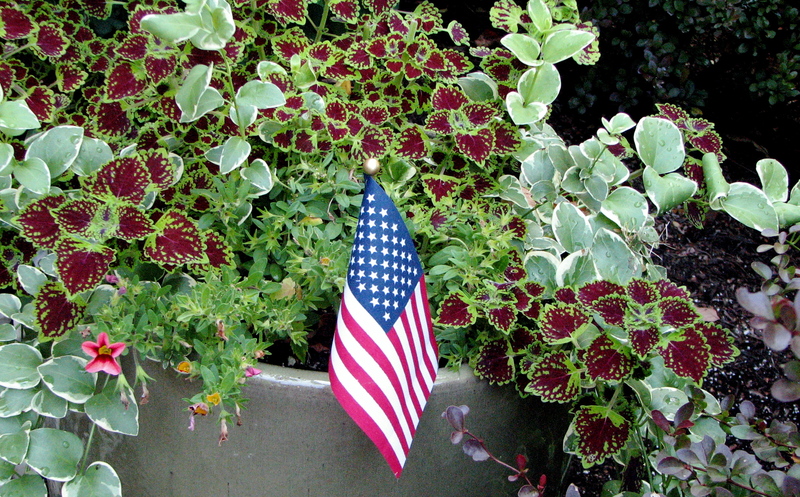 Not the traditional sort of Fourth of July celebration that we all know and love– but a practical use of our time. Which, God willing the creek don’t rise, means that next weekend we can have some fun. First, I sat at this desk, working on this computer, complaining about rain to the whole world via this blog. And I was grumpy. Then something amazing happened. We had a rainbow. 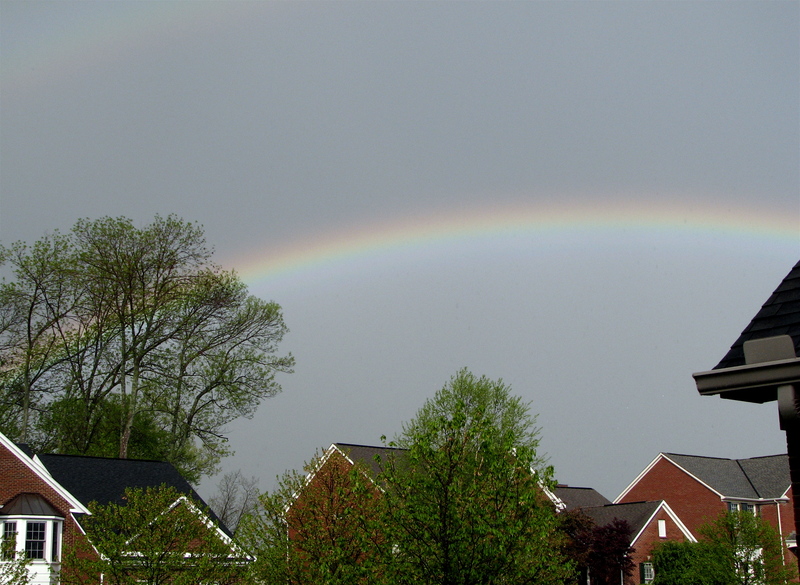 Not just any rainbow, but the biggest and brightest one I’ve ever seen in this part of the USA. A rainbow of such significance that Z-D phoned me on his way home from work to make sure that I was seeing this rainbow. And I was stunned. Then yesterday, because the sun was shining, I was able to plant colorful flowers and pretty viney things in the many garden pots that decorate the exterior of our home. 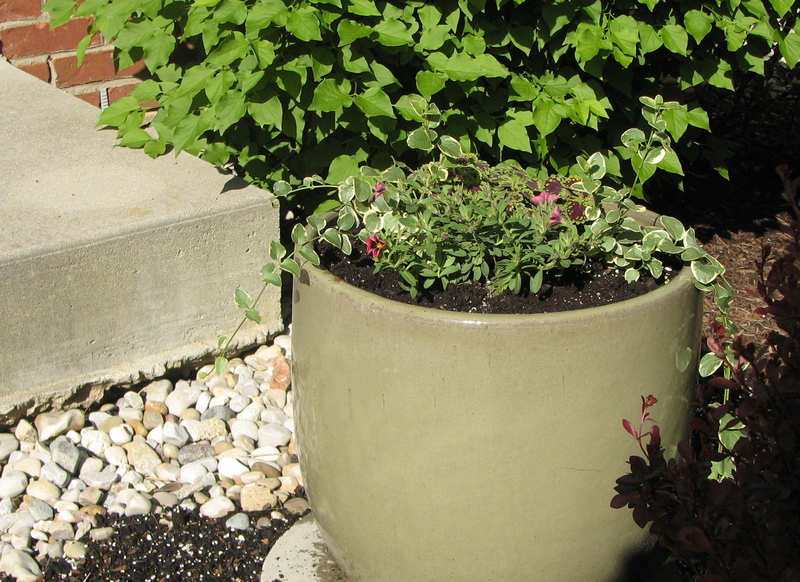 Pots that I really love to look at when I’m driving up the driveway or walking up the sidewalk. And I was very happy. So even though the weather forecast for today is rain, I’m still in a good mood. Creating the flower pots yesterday brightened my spirits. And reminded me that when the nice weather gets here, I must make the effort to enjoy every minute of it. TGIF, everyone. Make it a good weekend. Rainy or sunny.